It will be difficult for any country to follow the “Buy Domestic” approach. The global supply is so entrenched. Last weekend I went to a local rode. The unpredictable nature of the sport came to mind when I considered Trump’s nominee for the Fed Board of Governors, Stephen Moore. Functioning currencies are storehouses of value that are mediums of exchange divisible into small, useable units. Bitcoin fails on two out of three. Biotech in 1990, internet companies in 1999, vacation homes in 2005, cryptocurrencies in 2017. Now the fast money is chasing ridesharing pioneer Lyft, as well as other unicorns (private, money-losing companies valued at $1 billion or more). Lifting the trade tariffs with China will boost demand for many U.S. goods and ease the pricing of many Chinese items. But that won’t cure what ails the U.S. markets, which will be the focus after this deal is on the books. Muni Mayhem: This Boring Sector Is Starting To Heat Up! Wendell, I'm not as much of a fan of ETFs with their bond liquidity issues as I am of closed end funds like DMB. The issue with closed end funds is that most (like DMB) are leveraged. If the Fed raises rates in Sept, it will drive up the cost of leverage, lowering the returns on the fund, driving down the price. That could be a fabulous thing for those who wait to invest. Note - I do not own DMB. The Bureau of Labor Statistics (BLS) recently reported that headline inflation rose 0.2% in July and is 2.9% higher than last year. With investing, if you do it wrong you must make up for lost ground, which could take years, if it ever happens. Don’t become paralyzed by all the choices. Central bankers have to live in the real world where drawing lines on a graph is easy, but getting consumers to comply with the economic theory is hard. Any move we can make toward decentralizing retirement systems and putting them in the hands of individuals is a step forward. We are great at telling kids they can be anything they want to be. We need to do a better job of giving them ideas as to what is possible. It doesn’t matter how much the bank advertises that it wants to be my “friend,” or that it “knows what I need,” the truth is that it’s just business. Period. 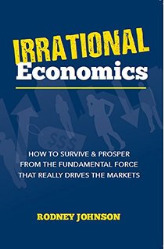 Rodney Johnson is a lifelong student of money and economic trends. He’s worked in the financial industry for more than 25 years, and he’s worked closely with Harry Dent since the mid-1990s. And how you can use this information to invest successfully.